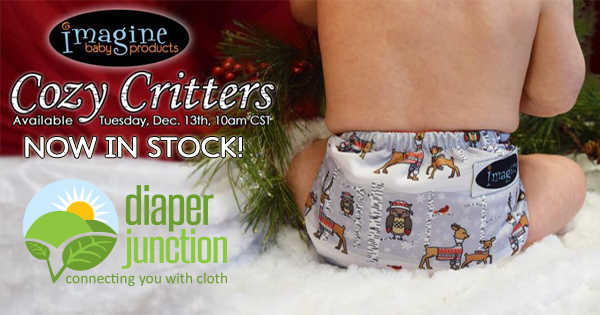 Cozy Critters by Imagine Baby is now in stock! Meet Cozy Critters, the latest and cutest print from Imagine Baby! Imagine Baby Products, made by the creators of Planet Wise and Best Bottom Diapers, is an economy line. Imagine Baby was created to bring cute prints, great function and quality to families who may not always be able to afford the top of the line brand name cloth diapers. Diaper Junction is proud to provide cloth diapers and accessories to market that are affordable for all budgets, not just those with deep pockets. Click here to shop our budget-friendly Imagine Baby cloth diapers and accessories, and don't forget that we SHIP FREE in the USA when your order totals $25 or more and ALL orders earn 10% back in Reward Points which can later be redeemed for store credit!